An original NEW ZEALAND Made KNUCKLE-DUSTER FIGHTING KNIFE from WWII, complete with original brown leather sheath. 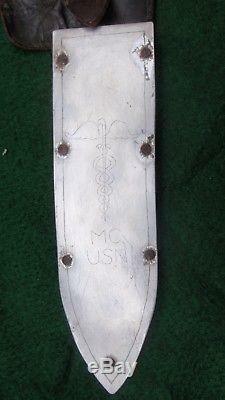 The front face of the sheath has a metal flat shaped strip added inscribed MC USN together with the USN medical symbol. This knife belonged to a Californian Bay Area USN Medical Corpsman who was attached to the 3rd USMC Division (I don't have a name). The 3rd was in Guadalcanal and Guam 1944. This example is not marked as was typical. Double edged blade approximately 6.2 inches long. Cast Alloy/aluminum handle another 4.6 inches. Total length of leather sheath around 11.75 inches. Single retaining strap functional and complete. The metal inscribed facing has obviously been added by the owner and the attachment pins/prongs show the correct aging - see photos. The blade shows age and surface marks/pitting etc but the original shape exists with no distortion. Leather sheath has aging and surface rust on the metal components but is complete - see photos. Overall a rare and very desirable fighting knife from WWII. Note due to many overseas country restrictions sale is limited to the US market. The item "NEW ZEALAND KNUCKLE-DUSTER FIGHTING KNIFE-USN Corpsman / USMC Pacific Guam WWII" is in sale since Saturday, August 25, 2018. This item is in the category "Collectibles\Militaria\WW II (1939-45)\Original Period Items\United States\Edged Weapons". The seller is "shackvp293" and is located in United States.